While 2009 was a difficult year, 2010 represents tremendous opportunity. Early indicators suggest that the economy is on the mend. While I don't expect budgets and activities to return to 2007 levels, executives have stopped behaving like ostriches and are increasingly considering how to build and improve business operations.We're seeing this in both our own client base and in our daily conversations with hundreds of IT decision makers. I've called the fourth quarter of 2009 the most important quarter of the decade. Hopefully, you ended the quarter strongly and are well positioned for success in 2010 and beyond. This new quarter will also be critical -- market share is still up for grabs and as you solidify your position within accounts and markets, you will be ensuring future profitability for many years to come. Weaker competitors are still sitting on the sidelines, wondering what has happened and whether their fortunes will ever change. Agile competitors have already launched new tactics to gain market share in well defined target segments. Each of these five levers incorporates a number of elements. In the interest of time, we won't go into those today. Additionally, we're going to leave off the discussion of the heart of the framework itself -- the issue of sales productivity. Sales productivity is a meaty issue. Most B2B organizations have some definition of sales productivity and in our experience most of those definitions lead to one rathole or another. (Hint -- it's not the number of calls a rep makes or the amount of revenue delivered in a given time period). For an initial discussion of sales productivity measures, please see the IDC best practices report we published in 2008 on sales metrics and KPIs. This report will help you to start thinking about how you can collect the sales metrics and KPIs that allow you to measure true sales productivity and leverage that knowledge into action that improves your productivity. That's an important big picture discussion, but not one that will help you to improve your performance next month. 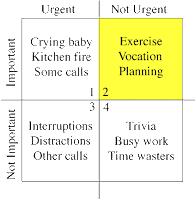 You need to balance the important and urgent tasks (See the Covey matrix to the right). If you ignore the important tasks, they will eventually become urgent...and how most sales organizations manage sales productivity is becoming urgent. Sales people must have the right conversations with the right prospects at the right time! It seems so simple. Yet most larger B2B sales organizations are still working on organizational realignment, tactics to extract more revenue with their existing customers or what to do about a competitive threat. While these are useful discussions, they must not form the basis of your market development strategy. Which of our prospects said "no" to us six to nine months ago? Which of our prospects has contracts coming up for renewal in the next three months? Which of our competitors is having a tough time in the market? What is the buying profile of our customers? After they've bought something from us, what is the next most likely purchase, and when does that purchase typically happen? What triggers signal buying intent? Which of our prospects is growing fastest? Which of our clients is growing fastest? Once you've completed this analysis (and you should be conducting it at least quarterly), you'll have a series of lists of sales targets and a good set of "stories" as to when and why a particular target will buy. Work with field marketing to deliver targeted messages. Work with sales operations to parse out the targets on a controlled, measured basis. Monitor the results carefully -- some of these segments will respond better than others, and you will want to shift your marketing and sales resources to the most productive segments. As part of this initiative, you will need to rearchitect the sales conversations. What are the key "care-abouts" of a given client or prospect? Why should a given prospect buy now? Why should a client upgrade now? (Hint, it's not because you need the revenue!). Deliver these new sales conversations as scripts for territory reps and channel partners. Deliver them as podcasts for enterprise reps and channel partners. Validate those conversations by asking for feedback. Congratulations, you've now just improved your sales enablement capabilities. You've got a secret weapon in your sales organization. This secret weapon can be used to significantly improve sales performance and results, yet in most organizations this resource is spending most of its time filling out reports to deliver to management. Oops. This secret weapon is your first line sales manager. When the manager spends most of his or her time coaching reps, rep performance soars. In the short term, lighten up on the managers' reporting responsibilities. In the longer term, rearchitect this role so that it is a coaching role rather than a data management role. For a deep discussion of the first line sales manager role and related best practices, take a look at this recent IDC report. Effective sales management also ensures the application of the appropriate resources to specific pipeline development activities. While few organizations expect their highly paid enterprise reps to be conducting marketing activities, these same reps may be expected to both cold call new opportunities and to manage existing relationships. Savvy organizations disaggregate the sales function, applying specialized resources to specific tasks. (I'll cover this issue in detail in an upcoming newsletter). Good luck out there. And please, take these issues on with the sense of urgency that they require. All three levers are really important and urgent, and I like the combination of them in the framework. But implementation will be different! Customer intelligence could be the easiest one depending on the data quality in the CRM systems - and it can be done sales internally as a regular task. I like the new role of the first line sales manager, getting more a coach than a data based funnel manager. Depending on the oprganization it will be a question of leadership and will request often different sales manager skills! Good idea!